The following images were created by David Harris for the New Hope Chronicles. We hope to post more as they become available. All images are copyrighted and all rights are reserved. The first image, used in the masthead of the home page, depicts planet Fibbia and its three moons. The top of Fibbia’s northern hemisphere is visible and you can see Forbidden Island in the middle the North Sea. The moons are shown moving into alignment for a rare triple eclipse which occurs at a key event in the story. The next image depicts the E.S. New Hope starship as it begins a dimensional jump. The image appears at the beginning of each chapter in Dragon Flame. 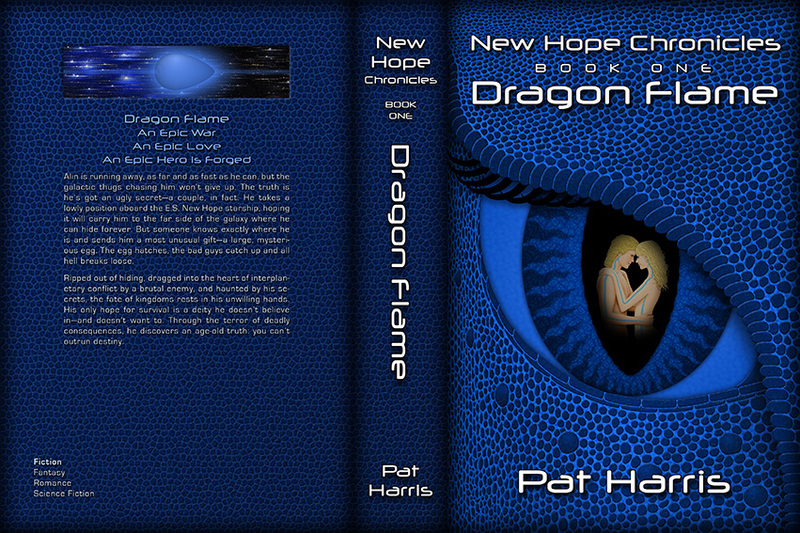 The next image is the cover of Dragon Flame. It depicts a reflection of Alin and Tori in an eye of dragon Miri. We went through several different cover designs before settling on the preceding one (above). The next image (below) is an earlier cover idea we were experimenting with. It also depicts dragon Miri, Alin and Tori. Notice the cyan stripes on Alin and Tori. All Fibbians have these “ribbons” but most are a subtle silvery gray color. A bright ribbon color is a recessive genetic trait that is not common. It is considered to be very attractive and is highly desired. Also notice the blue flame issuing from Miri’s mouth. This is also a rare trait that is very significant to the dragons. The fire of most dragons has a natural-looking orange-red color. 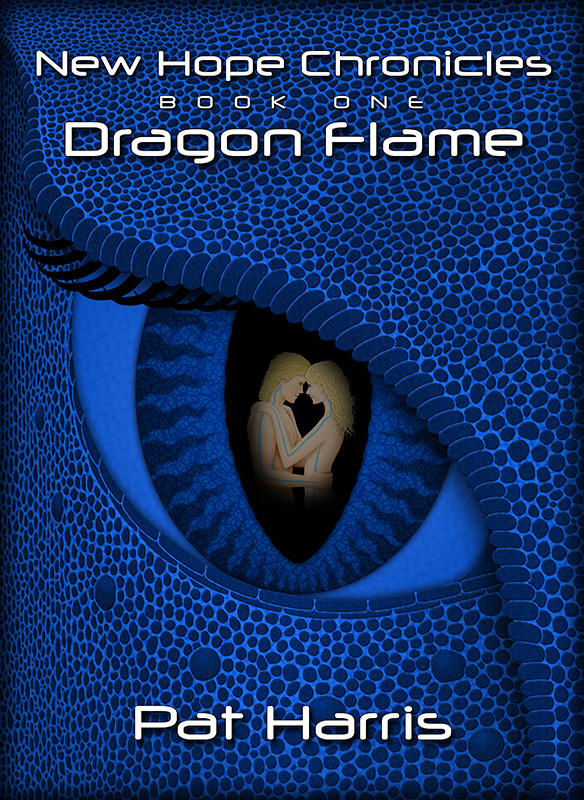 The next image is the cover art for the 726-page paperback release of Dragon Flame. All images copyright © 2012-2014 by David Harris. All rights reserved worldwide.